Shiva (Mahesh Babu) is an intelligent youngster who likes to help people. He joins as a phone call data analyst in Intelligence Beauro though he is destined for a much higher designation based on his qualification and intellect. He chooses the job of phone call data analyst because it helps him to prevent future crimes. He keeps rescuing people as he gets the know about possible murders/suicides in advance. In one such mission, he fails to save a college girl. The forensic evidence at crime scene indicates that there is more to that murder. In the process of his research, he stumbles upon a psycho killer. Rest of the story is about to what extent he goes to nab psycho killer and avert killer’s future crimes. Mahesh Babu: Mahesh Babu should be given a lot of credit to two things. One is to try a different subject and another one is for giving so much of space for villain character to dominate him. Mahesh Babu does the role of a intelligence officer who takes law in his own hands to act as vigilante. Mahesh Babu who is known for subtlety had done a perfect job in this film. He exhiliarates you in few scenes with his perfect work. Others: Rakul Preet Singh doesn’t have a meaty role in this film and she is good. It’s SJ Surya who walks away with honors among the other actors. He is terrific in the bridge scene before interval. He looks soft and feminine at times. Yet, you fear him because of his dangerous mind. The kid who acted in the flashback deserves huge appreciation (his character worked in a big way due to terrific characterization by Murugadoss and superb background music by Harris Jayaraj). Priyadarshi is good as a buddy and RJ Balaji is under utilised (may be there two guys roles are reversed in Tamil version). Most of the actors are new for Telugu audiences except for JP and Nagineedu. Story - screenplay - direction: Murugadoss has come up with another interesting story idea where a Government official becomes vigilante in society by eavesdropping on phone conversations. A story of this type can be narrated in either a completely realistic manner (Thupaki style) or in a superhero style. Director has selected a midway. He has written a terrific backstory for the villain character. The way technology was used to locate people and hear the conversations reminds us of Steven Spielberg's Minority Report (released 15 years back in 2002). Murugadoss who has used Christopher Nolan’s Memento in a terrific way to write Ghajini, has made sure that the villain’s orientation in last half an hour film is similar to that of Joker character in The Dark Knight (hero - villain interrogation, villain giving hero a task to avert disaster and then escaping from the custody while hero is away). The flashback episode is one of the best character establishments I had seen for a villain character in the recent times. Few episodes like rescuing mother are very interesting. Murugadoss definitely doesn’t get Telugu sensibilities right and you can see Tamil nativity and Tamil body language exhibited by lot of characters (only a handful of characters are done by Telugu actors). He should have taken care of the latter part of the film (post hero-villain interrogation). The concept of SPD (Sadistic personality disorder) is explained well. Other departments: Harris Jayaraj’s tunes for this film are not fresh. But he makes it up with his background score. The bgm he uses for villain character is superb (it’s entertaining as well as spine-chilling). Cinematography by Santosh Sivan is excellent and sets the mood for the film. Dialogues written by Murugadoss are good. He sums up the message of the film with this dialogue - Humanity is nothing but an unconditional help to a stranger. He comprehends that we are connecting to the screens of mobile, computer and TV and disconnecting from the fellow human beings. For a film of 120 crores budget, we definitely expect graphics of better quality. Editing is alright. Any dances are pleasing to eyes, if they are choreographed by the choreographers who understand actor’s body language. The choreography and costumes in songs of the film didn’t help. Production values by NVR Cinema are good. Analysis: When you have a superstar like Mahesh and an alleged budget of 120 crores, one expects a film that matches the grandeur in terms of storytelling and subject. 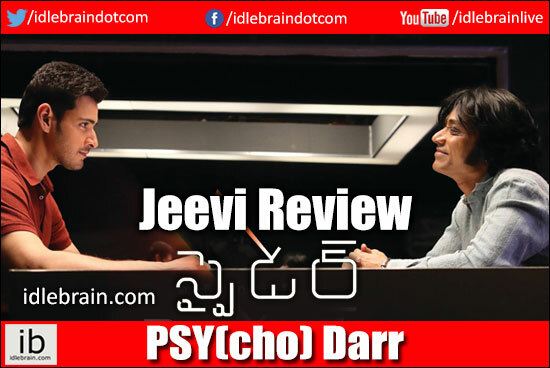 Spyder turned out to be a vigilante film with less scope for heroism. Hence there is a clear mismatch between expectations and deliverable. If you go as a normal movielover who were to watch a Murugadoss Telugu dubbed version of a Tamil hit film, you will not complain but for an ineffective pre-climax and climax. Since it’s projected as a straight film made on gigantic scale (only next to Baahubali in terms of budget in Telugu so far), people do have a lot of expectations riding on this film. Plus points are Mahesh Babu, villain character (especially the flashback episode) and a few episodes. On the flipside, pre-climax and climax are let down. Romance track is not fresh. There is a lot of Tamil nativity/body language in a film that is set against Hyderabad backdrop. The background of villain may appear raw for regular moviegoers. On a whole, Spyder is a nice selection from Mahesh Babu in terms of story and intent, but the director has given something which audiences were not expecting! PS: It’s so relieving to watch a film without anti-smoking/anti-drinking ads. This film didn’t have those ads because there is not even a single smoking/drinking scene in the film. Thanks a million to Murugadoss for that!